With enough room to ride for at least half a crank turn, a rolling pedal hop can add up momentum to the acceleration of a firm pedal kick, enabling longer jumps. 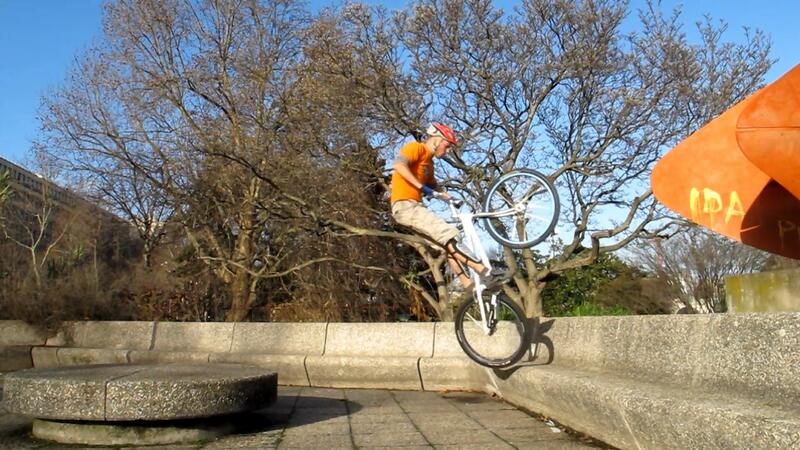 For a longer reach, swing the rear wheel forward. Thanks to this extra momentum, the rolling pedal hop offers a longer reach and is smoother than a plain pedal hop from a balanced position. It is more energy-efficient and also a good starter to build extra momentum for the double kick to nose-pick climbing technique. You can think of it like the initial launch of a wheelie accelerated with a pedal kick. The rolling pedal hop requires a perfect synchronization of body language with your pedal input. The pedal kick acceleration should take place exactly during take-off, at the end of what looks like a wheelie. Use the edge of a small kerb or a virtual line on the ground as your visual bearing. 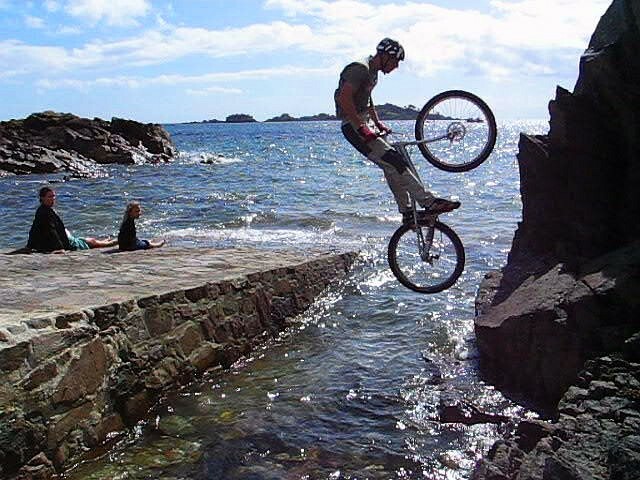 A rolling pedal hop over some sea water. From a trackstand position, ride the first quarter of a crank turn pushing on your good foot to set the bike into motion and crouch progressively. Follow up driving the second quarter turn on your lazy foot, leaning back and pulling on the handlebars to lift the front wheel slightly. Accelerate the move on your strong-foot again, springing back into a full extension while kicking on your good pedal. At this stage, the kick and jump extension should be synchronized with the rear wheel leaving the edge of the gap you want to leap over. You should end up in full extension over the gap. 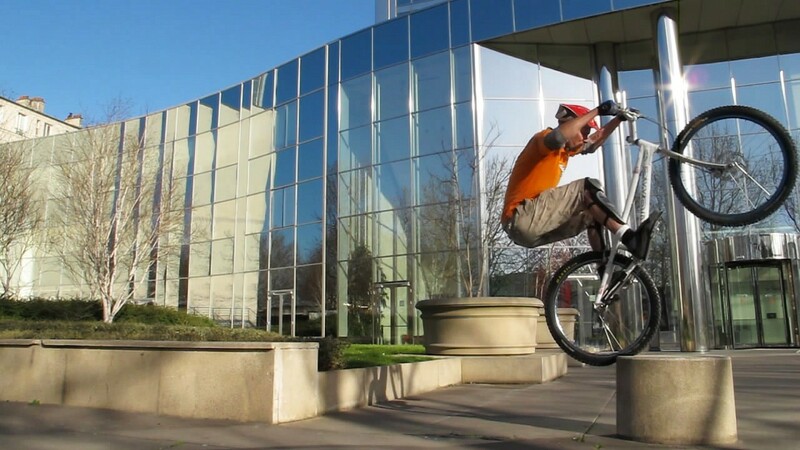 In mid-air, pull up on the handlebars and stretch your legs forward to tilt the bike vertically. This helps you to swing the rear wheel forward, bringing it closer to the other side of the gap for an earlier and smoother touch-down. 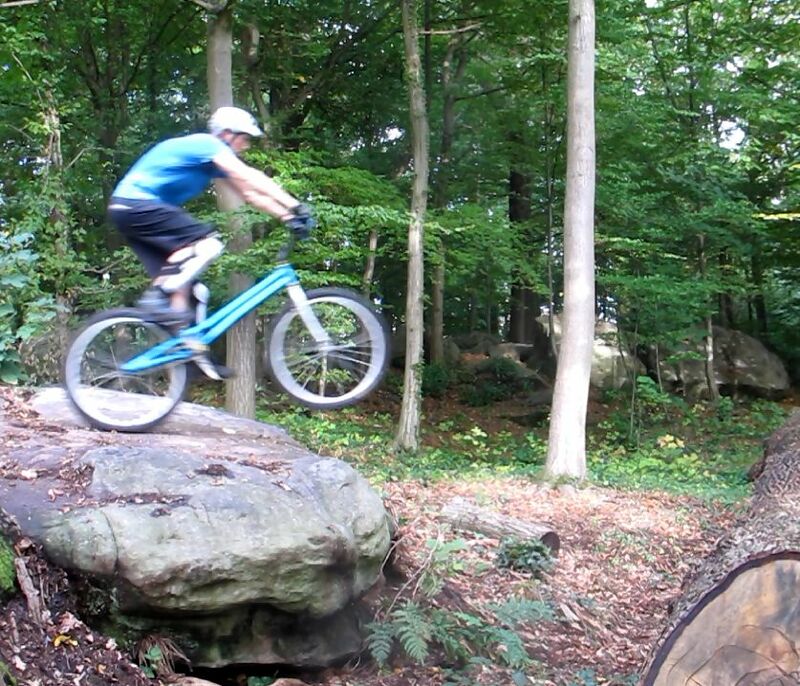 Lock the rear brake before the rear wheel touches down to secure your landing. Don't stand too rigidly, flex upon landing so as to damp the impact smoothly. If necessary, move closer to the handlebars and lean forward to let the bike tilt forward upon landing. That will help you absorb the impact completely. 1° From a trackstand, ride the first quarter of a crank turn pushing on your good foot to set the bike into motion, crouch progressively. 2° Follow up driving the second quarter turn on your lazy foot, leaning back and pulling on the handlebars to lift the front wheel slightly. 3° Accelerate the move on your strong-foot again, springing back into a full extension while kicking on your good pedal. 4° You end up in full extension over the gap. 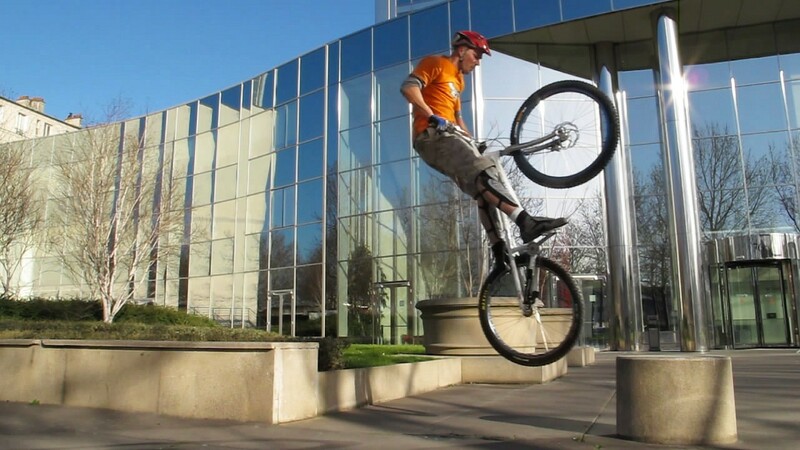 In mid-air, pull up on the handlebars and stretch your legs forward to tilt the bike vertically. 5° Stretch your legs to swing the rear wheel forward, bringing it closer to the other side of the gap for an earlier and smoother touch-down. 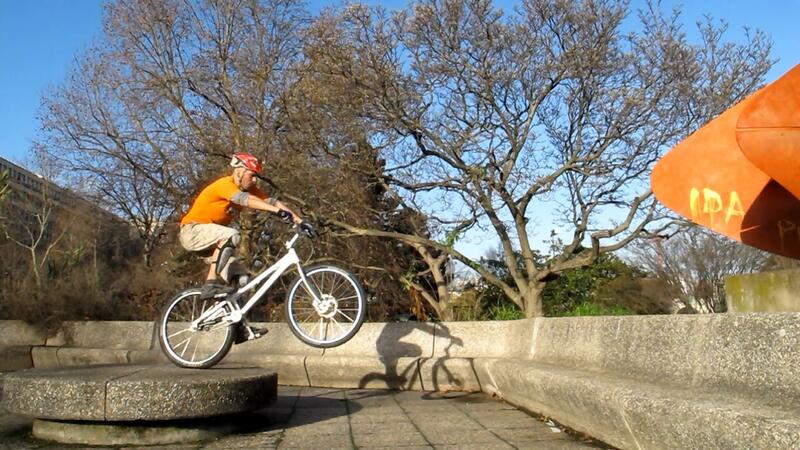 6° Lock the rear brake to secure your landing. Don't stand too rigidly, flex upon landing so as to damp the impact smoothly. Make sure to take-off at the last moment. Get to know your distance marks, which depend on the gear ratio you use and whether you ride a mod or a stock bike. You can check this manually by pulling your bike backwards, from the final pedal position before the kick, with the rear wheel over the edge, to your initial pedal position where you will be trackstanding (just let the pedals' position tell you when you are there). You should always start on your good pedal, at about one full crank turn from the gap. Use the first quarter crank turn to control your speed on your strong foot. Use the second quarter turn on your lazy foot to lift the front wheel off the ground while transferring your weight over the rear hub. This brings you ready for an accelerated kick on your strong foot during which you can spring up into a full jump extension. 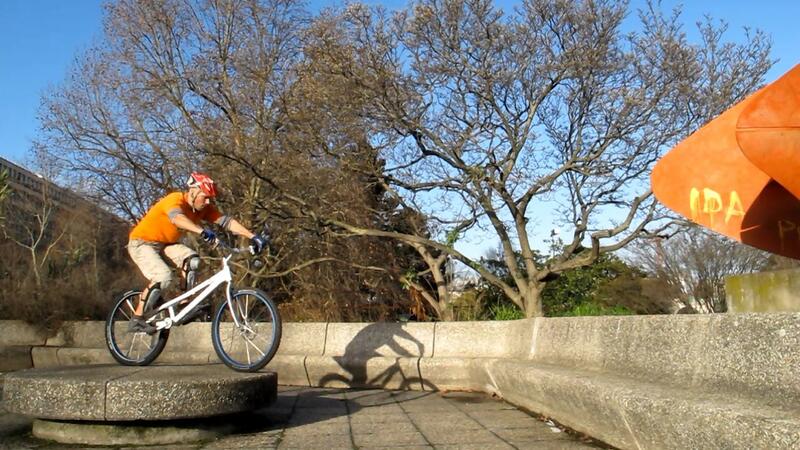 Try to keep the front wheel as low above the ground as possible before the pedal kick. This will give you more torque and make the pedal kick more powerful (like when lowering the front wheel before a pedal hop). After a lot of practice, you will be able to reduce the run up distance to a minimum, that is, skipping the first quarter turn to start directly on your bad pedal. 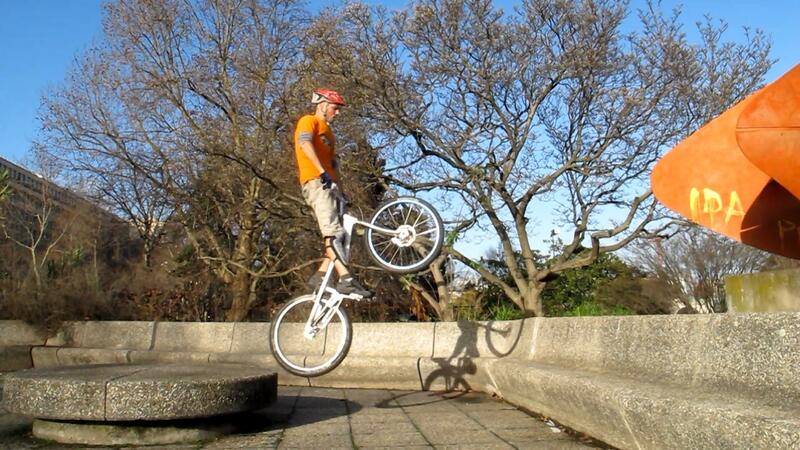 Make sure you lift the front wheel up before take-off, otherwise, you may end up diving with your front wheel first. For this to work, body language has to play a bigger part and compensate for the lack of initial momentum. In that case, lock your brakes to maximize your initial surge and push on the ground before accelerating directly on your lazy foot (exceptionally positioned forward). 1° From a trackstand position, with your lazy foot positioned forward, crouch so as to surge forward and thrust your hips from further back. 2° Surge forward and accelerate with a quarter turn on your bad foot, pulling yourself on the handlebars to take-off the front wheel. 3° Finish off the move on your strong foot again, springing into a full extension while kicking on your good pedal. The rear wheel leaves the edge. 4° Stretch your legs to swing the rear wheel forward, bringing it closer to the other side of the gap for an earlier and smoother touch-down.